® Dairy Wrap"> Edmundston, NB and Madawaska, ME (June 20, 2013) – Twin Rivers Paper Company, a leader in lightweight specialty packaging, label and publishing papers, announces the release of Acadia® Dairy Wrap, an oil- and grease-resistant (OGR), uncoated packaging paper specifically designed for margarine and butter wraps. FDA compliant for direct food contact and available in natural options, this state-of-the art packaging paper brings converters, brand owners and consumers a wrap that optimally performs throughout the supply chain. 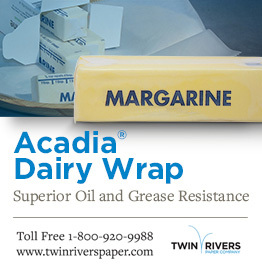 “Acadia® Dairy Wrap provides superior oil- and grease-resistant properties for these demanding applications. This packaging paper is designed to provide flawless performance starting from our customer’s converting line to the consumer’s kitchen,” says Marcel Fortin, Business Development Manager. Acadia® Dairy Wrap is part of a broad portfolio of specialty packaging papers that brand owners and converters trust for printability, quality and overall performance. These specialty packaging papers offer a wide range of basis weights, barrier technologies, advanced coatings and environmentally-friendly options.